The morning came with a cloudy sky. We packed our tent and countinued to Verona. At he first bigger town (Egna - Neumarket) we stopped at a Supermercado to get some breakfast which we ate at a parking lot. The terrain slowly started to be flatter there were still nice twisty roads. After driving by a few castles we stopped at one some 40 kilometers from Verona (Caste del Aero). The place had of course been prpared for tourists but nevertheless it was a nice old castle with lots of potential for good parties and excellent view of the Trentino valley. In Verona we checked in at the same camping we had stayed at last year when interrailing. the camp site is built into the old city fortress - this time we slept in one of the guard towers. After a quick shower we went to get some food and to find a place where to get the pictures for Bergie’s digital camera to CD. We found a photo shop where we were told to come bck next morning as the place was closing. We had a nice italian dinner - lasagne bolognese and pasta carbonara - and learned the location of the local metal cave. The place was called Transylvania Bar (on Via Galliano) and as the bartender thought it’s too hard to explain where it is we took a taxi - only to find it’s closed for summertime. Not letting ourselves to get depressed of this minor setback we decided to get more beer and find some place with some action. When walking around the plaza near the local arena somebody came to sell us opera tickes. Bergie wasn’t thrilled about the idea of going to opera but Skoll went to check the price of the tickets. After some negotiation we decided that as neither of us had been in opera in Italy before we’d check it out. We haggled the price from 40 euros (two tickets) to 30 euros and found our seats some five minutes before the preformance started. The bit was Verdi’s Il Trovatore (Troubadure) and both our us agreed that it’s much better to see it in moonlight when drinking beer at a place where lions ate christians some thousands years ago than in the Helsinki opera house. The following morning we checked out from the camping site and visited the photo shop only to find that the shopkeeper was off taking pictures of Verona. With this slight setback we ate breakfast and continued on the road SS11 towards Milano. At Lago di Garda we decided to see some sights and drive around the lake. The Garda lake is a huge beach resort with clear blue water and impressive mountain surroundings. The twisty road around the lake was packed with tourist buses and lanesplitting motorcyclists. We had heard the rumour that bikers wouldn’t greet each other in Italy but this turned out to be not true, as most did. While the sights were great, driving around the lake was mostly stop-and-go type as always some car was turning into the parking places near the beach. After Garda lake we continued on the road to Milano. The old Milano road was mostly bypassing city centers and suburbs, and so we encountered a surprising number of roundabouts. We had tried to contact the local Midgard company in Milano, Teleura, but as it was saturday we failed to reach them. Since this failed, we decided to set into a camping site in Monza north of Milano city. This time the camping area had trees in it so Bergie was able to use his hammock. After setting up camp we walked to a local Spanish restaurant (Gordovia, near the autodrome) where we decided to eat well. At first the waiters tried to lead us into a back room, but after some negotiation let us sit with the others. Probably the accumulation of several days of road dust was visible in us. Especially the gnocchi and wine were good, even so that Skoll braved to taste some. Sunday morning started pretty clear but turned cloudy shortly after we hit the road. We decided to take the highway to the French border and countinue the twisty Alp roads after that. 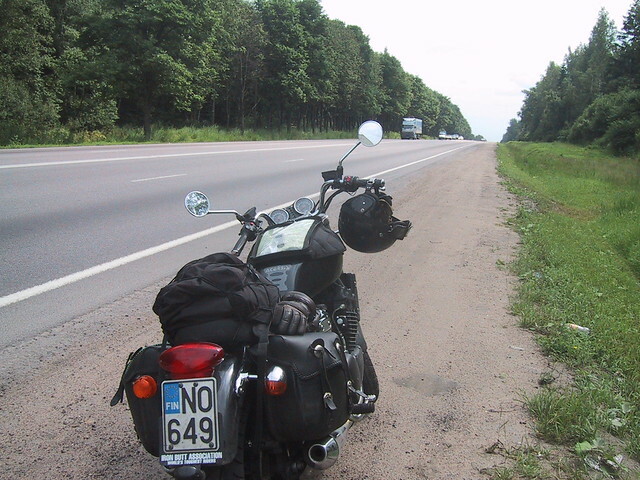 During the 160 kilometers we had to stop at four road tolls. In Susa, Italy we turned to a smaller road SS25 and the Alps started again. The road was once again packed with motorcyclists and tourists but the going was easy. Somewhere during the way we crossed to France but the only thing to indicate the change was the change of the language in signs. 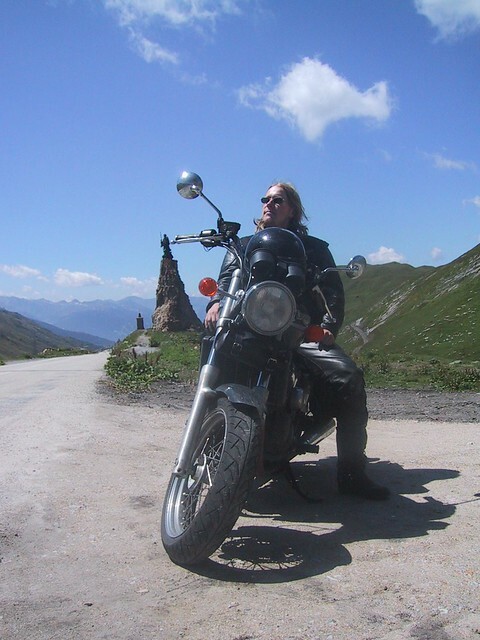 The road didn’t have nealy as much hairpins as the Dolomites had which suited Skoll just fine. There was also a clear mountain lake making the scenery really impressive. After the first peak we stopped at a small village called Bonneval to look at a place to eat. At the same time rain started. Unfortunately all the three restaurants which accepted credit cards - we were out of cash at that point - were closed. As the rain didn’t seem to be ending - actually it showed only the first signs of a starting thunderstorm - we decided to wear our rainsuits and countinue to Val de Isere. The distance was only about 10 kilometers as the bird flies but due to the twisty roads and the rain it took as two hours to get there. The road itself was almost like designed for bikers - a twisty path going up to the peak of Col de Isere with solid mountain on one side and several hundreds of meters of clear fall on the other side. And the landscapes were once again amazing. Unfortunately Bergie’s camera run our of battery so I can’t even tell you to look at the pictures - there are some though - but try to imagine yourself on the top of a peak of 2800 meters with mountans all around you and the clouds so close you can almost touch them. After the stop at the peak and some chocolate for lunch we continued and finally reached Val de Isere. We found a decent hotel - with a not-too-decent price, but as the roaring of the thunder continued until the sunset it was a good decision - and both had (separately) long baths. After freshing up we had a dinner in a nice restaurant and turned in for the night. 22 July 2002 in Geneve, Switzerland. 2 minute read. 10 July 2004 in Bryansk, Russia. 2 minute read.